A two minute walk from the house takes you to the ruined church with the ancient burial ground. The large graveyard here is fascinating to explore;the graves include several to Polish, Canadian and Australian soldiers dating from the second World War. Just past the church you can walk over the wooden bridge which spans the Skiach River. From here you can walk beside the river to Evanton Village, through the village and back across the bridge over the A9 and along the foreshore, approaching the house from the opposite direction. This scenic circular tour will take around an hour at a leisurely pace. On your way you will pass what used to be the Balconie castle, an old seat of the Mormaers and Earls of Ross, chiefs of Clan Ross. It was later held by their successors, the Clan MacDonald, Earls of Ross. At various times, the castle was also held by the Clan Munro, as well as having a period of Clan MacKenzie ownership in the 19th century. It was after the war that the castle was bought by A.J.M. Munro, a timber merchant from Alness, and lay empty for some years. It fell into disrepair and by the 1960s was unsafe and was demolished. The rubble was used in the construction of the new aluminium smelter a few miles away at Invergordon. Nothing is left of the building - it is just a field. However, you will see that the castle's walled garden still survives on privately owned land. The beach is literally on our doorstep, with magnificent views across the Cromarty Firth. Take a right after walking over the skiatch river bridge and strole along the foreshore, which eventually leads to Invergordon. Breathe in the clear air, spot wildlife and work up an appetite canoe outside the guest housebefore breakfast or dinner! Local produce, crafts and gifts together with a cafe make this a worthwhile stop. A few hundred yards south of the Storehouse is a lay-by from where seals are seen most days at low tide. The Black Rock Gorge is a magical deep and narrow cleft in Old Red Sandstone conglomerate through which the Allt Graad flows in Easter Ross, Scotland. It was caused by rapids heavily burdened with sediment being carried upwards as part of the great Post-glacial rebound. The gorge is situated at the edge of Evanton Wood and is a fascinating few hundred meters in length and reaches 36 metres (120 feet) in height. The Black Rock Gorge is the subject of local Gaelic myth, in which the Lady of Balconie is lured into her depths by a mysterious man, thought to be the Devil. Ever since, the cries which she utters can be heard from the top. In April 2004, ten days of filming took place in the area for the movie Harry Potter and the Goblet of Fire and the gorge is the setting for one scene. Glen Ord is about 13 miles away at Muir of Ord on the A682, Dalmore is a short distance north of Kiltearn on the A9 and Glenmorangie is about 20 miles north of Kiltearn in Tain on the A9. Please check opening times to avoid disappointment. Let us arrange a tour for you! From a couple of hours to a whole day, you can't come to the Highlands and not visit a distillery. Loch Ness with all its visitor attractions is about 30-40 minutes’drive away via Inverness. Day and evening cruises run regularly and private trips can be arranged. Please check operating times to avoid disappointment. The wooded slopes along the shore of Loch Ness are home to an abundance of wildlife, including deer and osprey. The Loch Ness Centre and Exhibition Experience is worth a visit. Inverness, the capital of the Highlands is a quick 20 minute drive away. There's always something happening in Inverness, with plenty of places to eat and drink. Places to visit in Around Inverness. Take a short drive along the A9 towards Alness. After crossing the River Alness park in the first layby on the left hand side of the road. You can walk down to the river and stroll through beautiful scenery, past the weir, into the village of Alness. Alness is a very pretty village with many interesting shops and tearooms. There is a path on the opposite side of the river for the return journey. This interesting Victorian spa town has much to offer and is worth a visit. The birthplace of Hugh Miller who wrote on a vast range of topics from religion to geology as well as local folklore. The old courthouse has now been made into a museum. Approximately 15 miles away an the A862 is the busy little village of Beauly. The Old School House of Beauly is a pleasant place to stop for tea and cake and the adjoining shop is definitely worth a browse. Also worth a visit are womenswear boutiques Muse and Maggie Blyth, selling stylish clothes for all ages from Day Birger et Mikkleson and Mawi to Terry Macy. The Black Isle has many visitor attractions ranging from a wildlife park to a small brewery, small harbours, special beaches and wildlife including dolphins. Why not sample the beer here at Kiltearn House? A day out at the Falls of Shin is great fun for all the family. Located in Sutherland, the dramatic waterfalls and the famous, natural Atlantic Salmon Leap make this a well-worth visit. Open all year round. 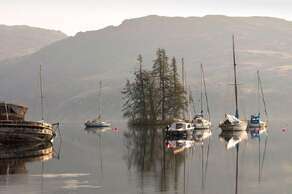 Ullapool and Skye on the west coast are within an easy drive of Kiltearn House. Although described as being on the East side of the Northern Highlands, Evanton is situated on the narrowest part of Scotland where it is only about 50 miles from coast to coast, so a trip to the west coast and the Isle of Skye is possible in a day. John O’Groats is also just a fairly short drive away. Lovely stay - Glorious location, excellent facilities, immaculately clean and warm hospitality, what more could you want plus the breakfast is superb.